The Carnegie Gallery is definitely worth a visit if you are still looking for gifts or for something for yourself. A good number of artisans are exhibiting til the end of the month….some that are only there at this time of year, such as myself. I have my jewellery there so if you missed my open house, there is still an opportunity to have a look and see some of my work. My studio is also open by appointment if you would like to come by. My Christmas Open House was a huge success. We were swamped Sat. morning and Sunday a.m. as well. Thank you everyone who came by. It is so gratifying to see my pieces go to new homes or elsewhere as gifts. I was able to finish all my post sale tasks…..lengthening, shortening, making complementary earrings etc by Monday p.m. I was determined this time to get everything done in good time and I did…..which made for a relaxing rest of the week. And I do use the word “relaxing” in a loose way. Life around here tends to be very hectic. I think that I am ready. We start tomorrow at 11 a.m and are here until 4. Scott Barnim also has a sale going at his pottery and show room on Park St. in Dundas. One stop shopping….and there are several great restaurants to go to as well. Scott is offering 20 % off on all purchases….what a deal…and he has many wonderful pieces. I look forward to seeing you and a great week end. I am working full out to get ready for my Christmas Open House this Saturday and Sunday.(Dec. 7th & 8th). I am reading my list and checking it twice to make sure that I have everything that I wanted to have. This could be the year of the earring as I have over 100 pairs from $16 to $200. 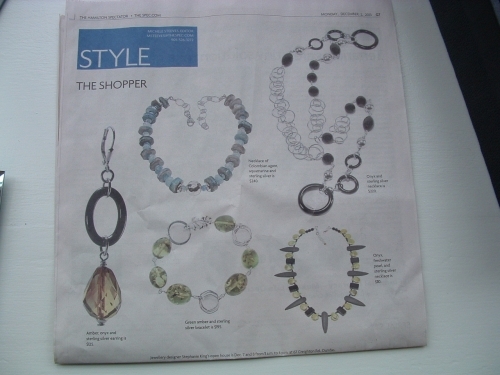 And not 2 alike…..
Michele Steeves of the Hamilton Spectator Style column included my work this past Monday. This support is just so awesome and I do and did thank her. If I were really at working with a computer, I would have scanned the spectator image and it would have been much clearer. But it is what it is. This time, I have designed pieces using Ametrine….a stone that I have never used before. It is a fusion of amethyst and citrine and quite lovely. There is a necklace, bracelet and several pairs of earrings. As well, I have some wonderful pieces of amber from Russia. Well back to work. Everything is coming out today and being arranged. then I will know is there are any gaps in terms of colour or design that I need to fill.